Beans and beef — both these bad boys boast high levels of muscle-building protein. But how do they compare when it comes to feeling full and satisfied after a meal? A recent study, had participants eat a slice of beef meatloaf (we’re talkin’ the size of a deck of cards), which contained 26 grams of protein and only 3 grams of fiber and a meatless vegan-loaf made from beans which had 17 grams of protein, but a whoppin’ 12 grams of fiber. It may impress you that there was actually no significant difference found in the amount of food that study subjects consumed later on, suggesting beans and beef are basically tied when it comes to feeling full and satisfied post meal time. Many tend to only think of beans as the magical fruit that the more ya eat, the more you…well, you know. A 2014 study even found that consumers were unsure whether you could get enough protein from beans on a meat-free diet. Alert the press — beans are in serious need of a PR makeover! In a plant-based diet, beans are key players. They contain high levels of satisfying protein and all that fiber will help fill you up. That makes for a combo that has so many health benefits! Just a ¾ cup serving gets you about 1/3 of the way to your daily 30-35 grams of fiber goal. Plus, they’re incredibly rich in a variety of protective nutrients that may be associated with a reduced risk of breast and colorectal cancer. 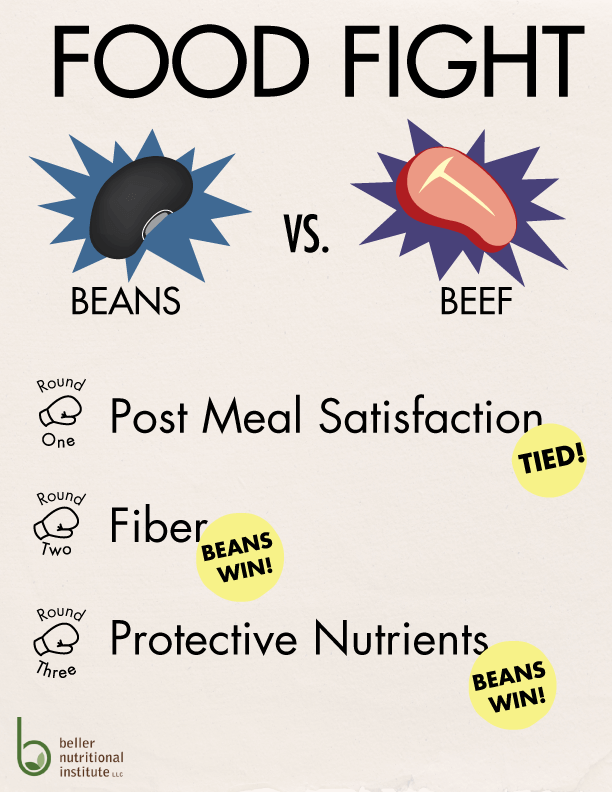 When it comes to choosing a satisfying nutrient packed protein source, it’s time to jump on the beans wagon!